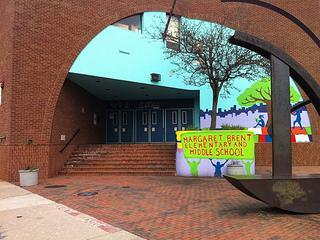 Margaret Brent Elementary Middle School is a small school with a diverse, family like environment that educates the whole child with a focus on Character, Creativity, and Community. The school was named for Margaret Brent, the first female practicing lawyer in colonial Maryland. Today, the student population reflects the varied social, ethnic and socio-economic groups in the communities of Charles Village, Harwood and Remington. Margaret Brent Elementary is a Community School in partnership with Greater Homewood Community Corporation which connects the school to resources in thecommunity. Through this collaboration, the school is a working example of the community and school working together to provide the best possible environment for the personal development of each child. The schoolyard features murals and sculptural artwork. EMEF. "Prof. Francisco Salles Nogueira"